Log into 1stPayMobile with your 4-digit login PIN. From the bottom menu, select the clock icon which will bring you to History. The 100 most recent transactions will display. Recent Transactions shows a Summary which includes Name on Card, transaction date/time, last 4 of card number, card type, transaction amount, and transaction type. A green checkmark indicates an approved transaction. A red X indicates a declined transaction. 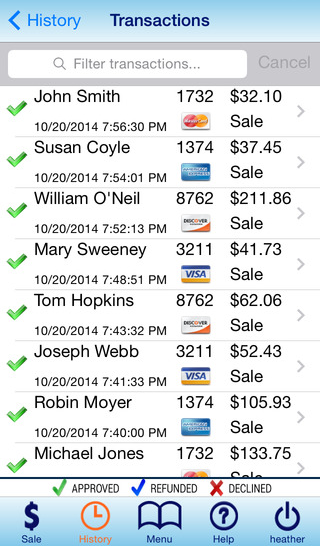 If you'd like to view details on a transaction, tap the transaction. You can refund or void a transaction from the Transaction Detail Screen. You may also print, email and text receipts from this screen. Note: Transaction Data is limited to the transactions processed on this device only. You may also view transactions in the Transaction Center. This will allow you to view a wider range and number of transactions, and also gives you reporting ability. To read about viewing transactions from the Transaction Center, see this article.